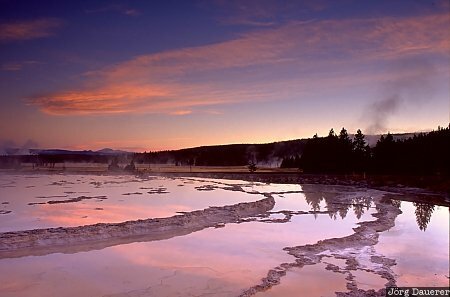 The pools of Great Fountain Geyser before sunrise with colorful clouds and their reflexion in Yellowstone National Park. Yellowstone National Park is in the north-west of Wyoming in the western part of the United States. This photo was taken in the morning of a sunny day in September of 2003.